A three-vehicle collision has blocked the A27 near the Toby Carvery in Worthing. 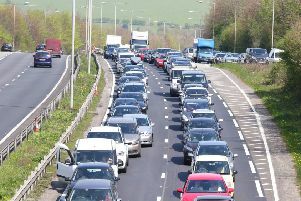 Traffic reports suggest three vehicles were involved in a collision in the westbound lane of the A27 Upper Brighton Road at the junction with Sompting Road, Worthing near to Chris’s Fish and Chips and the Toby Carvery Downlands. As a result, the westbound carriageway is partially blocked and delays of at least seven minutes are being experienced by drivers.